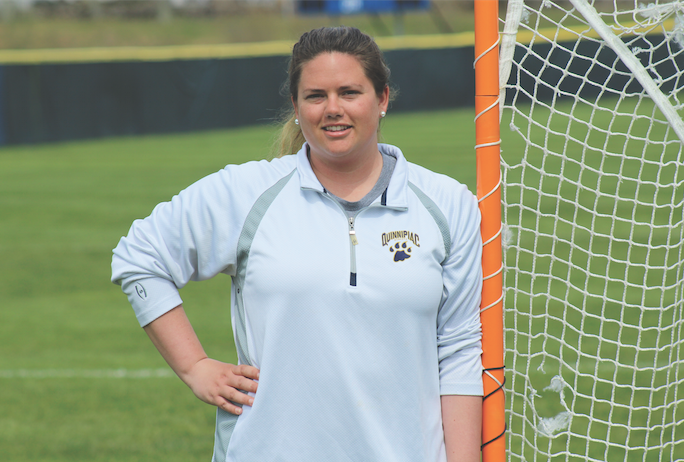 Formerly a player herself, Brittany Fortunato is right at home coaching Quinnipiac women’s lacrosse. After competing in three Northeast Conference championship games for the Bobcats and spending four years as an assistant coach, Fortunato is looking to rebuild the team as the head coach. Q: How old were you when you first started playing lacrosse? A: I was probably in third or fourth grade when I first started playing lacrosse with my youth league in my town. Q: How do you feel your role has changed now that you’re the head coach rather than an assistant? A: (I’ve got) a lot more responsibility whether it be with the team, budget-wise, or recruiting-wise, everything falls with me so it’s a lot more responsibility overall. Q: What is your favorite memory as a former student-athlete at QU? A: I would have to say playing in the championship game for the NEC three years in a row. (Those are) some of my favorite memories as a student-athlete. Just being a part of that and having that experience was so wonderful. We came up short, but that experience of playing for a championship almost every year here was really great. Q: What has been your favorite memory so far as a coach? A: Just spending time with my student-athletes and getting to know them on a personal level and getting to know who they really are. Being able to help them in any way I can and being able to really see them grow (have been some of) the best moments for me. And seeing how far they’ve come since freshman year to becoming seniors and graduating and going off and getting jobs. That’s really been a great moment for me. Q: Where do you see this team in the next couple of years? A: We’re definitely rebuilding… I see us being able to compete in the tournament in the future. I think our freshman class is very large and very talented. Give them a few years with some experience and they’re going to be a force to be reckoned with. Q: How does it feel to have climbed the ladder from being an athlete at QU, to assistant captain, to assistant coach, and now to becoming a head coach? A: It’s crazy actually. I love Quinnipiac. I think it’s a great place to be. I think starting with my college search (it was) the type of atmosphere I was looking for as a student-athlete and as a student. Having the opportunities that I had here to stay here and still work with the same type of student-athlete has been wonderful. Just being able to give back as an alumni is the best feeling. Being able to mentor young athletes (and having been) in their shoes and help them to grow the way that I was able to has been a remarkable experience. Q: What’s your pre-game routine? A: First I would start off thinking about what I want our lineup to look like, who’s in the best shape, and who’s gonna be our best option at the time. I like to talk it over with my assistants, and go through game plans with them. If we’re on the bus or on the road I like to listen to some music before. I talk through what I think is going to happen and talk to our scouts about what kind of offense we want to be in, what kind of defense we want to be in, and then just relax a little bit. Then I just go and talk to the team, tell them what I want them to do, and get them fired up. Q: What MAAC team is the hardest to prepare to play against? A: It depends on the year. I think this year it was between Canisius and Monmouth. Canisius has very good attackers… that if you’re not all playing on the same page can make plays happen and make it look easy. Monmouth I think was a little underestimated this year as a team. Overall, I think they have the most talented players as a group… They’re talented, and they’re fast and I think they were a little underrated in that aspect and I think they’re going to surprise people. A: My dream job is to stay here and coach for Quinnipiac – for where I played and for where I’ve given so much time because I really do love the school and I care about the student-athletes. It’s the perfect place. It’s home to me and I really do love it here. So this would be my dream job. Q: What are some goals you’ve set for the women’s lacrosse team at Quinnipiac? A: (I would like the team) to be more competitive in the MAAC and to be able to compete with the higher teams in our conference like Monmouth and Canisius and Marist. I think realistically, for this year, the goal is to be able to compete. I think in the future, it’s to be able to compete for a conference championship. I think that’s our ultimate goal to try and get a berth into the NCAA tournament. That’s always what we’re striving for but I think it’s going to take time and it’s going to take more experience for our younger players. I think moving from the NEC to the MAAC was a jump for us and I think we’re just starting to be able to recruit the kids that we need to be able to compete at that level. Q: If you could give one piece of advice to anyone aspiring to become a lacrosse coach, what would it be? A: It’s hard. It’s a lot of work but the end result and being able to change (players’) lives is worth it. Sometimes you’ve just got to stick in there and know that they’re student-athletes and they’re young and they’re going to make mistakes but at the end of the day they’re trying to do the right thing. It’s a really great experience to be able to do this.